Original article published on 29 January 2019 in Soft Power News, see the full article here. Over 30 Senior Police officers who are pursuing Masters Degrees in Peace Governance and Security have started the process of defending their research proposals. 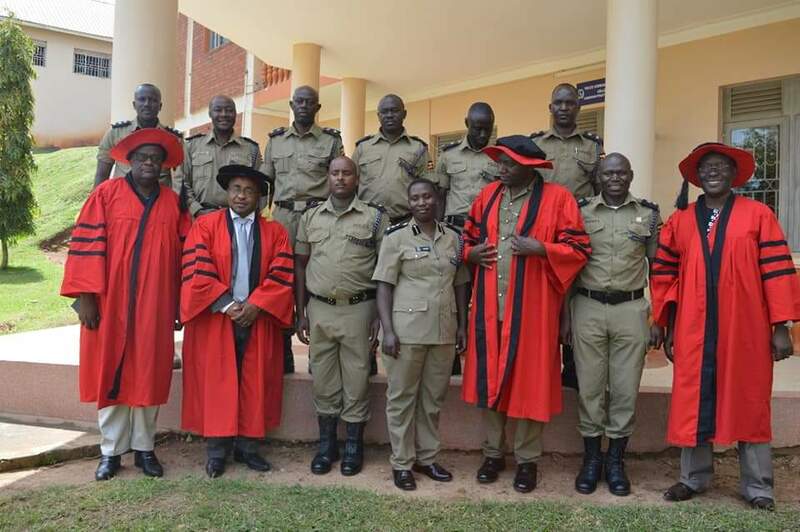 The 38 Senior Police Officers have for the last one year been pursuing Masters Degrees at the Police Senior Command and Staff College in Bwebajja, Wakiso district. As a prerequisite to receive the Masters Degree awards, the students must defend their theses before an academic pannel. The pannel is comprised of three Doctors and one Professor is overseeing the exercise. Prof Samuel Kale Ewusi, the Director Africa Regional program United Nations University for Peace ( UPEACE) one of the panelists says the course will help enhance Policing capabilities of the officers. “We are currently here to facilitate the defense of masters dissertation a very important exercise where the students present their research problems, methodology, as well as findings,” said Prof Ewusi. “So far, we have gone through a number of topics that are very important in enhancing and strengthening the capacity of Uganda Police Force,” he added. This, he said, will help Police Officers improve their work by making sure that decisions on the challenges facing the country can be addressed based on evidence or empirical studies and this will see the Police Force strengthened. This will be the second batch of Police Officers to be awarded Masters Degrees in peace governance and security.